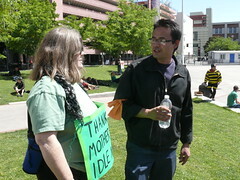 Thank you to everyone who made it out to our bank day protest and on-site occupation events yesterday. We had a relatively short General Assembly and decided by consensus to begin organizing an action event for Black Friday. The GA determined the event will take place from 8 a.m. to noon on that day and will have two locations, one in North Reno and one in South. We will venture to high traffic shopping areas and focus on trying to inform shoppers of alternative local options for products on their shopping lists. 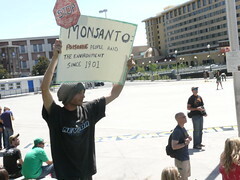 If you have any ideas to offer, please start a discussion forum on this topic or come down to the occupation in person. 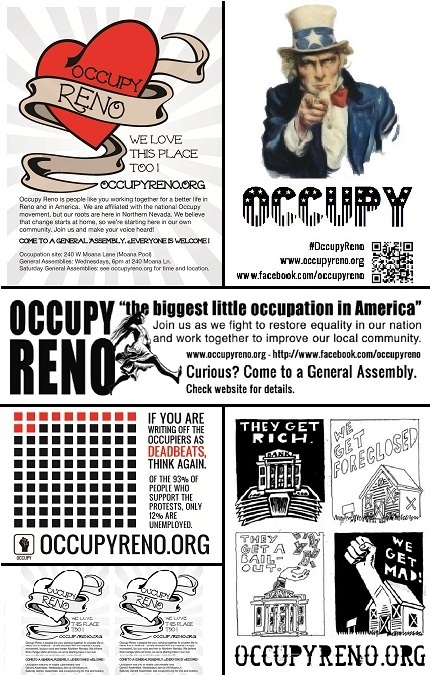 On that note, we are really trying to encourage everyone to utilize our new website to the fullest by contributing to the discussion board at http://discussion.occupyreno.org/. This is the best way to get your ideas out there, especially if you are unable to attend meetings and GA’s in person. We are checking this forum daily and will discuss these posts in committee meetings and General Assemblies. We are also trying to start sending out more updates via email, eventually hoping to make the email a daily digest with everything you need to know. We understand everyone is busy, and we want to keep you up to date as much as possible. 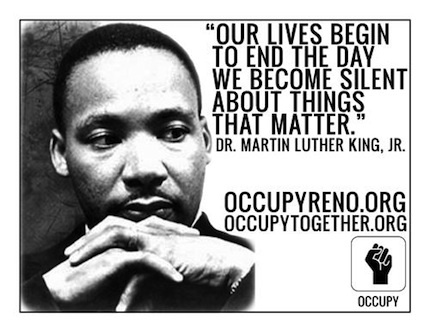 If you haven’t already, please subscribe at http://tinyletter.com/OccupyReno. We are actively working out the kinks and trying to be as efficient and effective as possible, both at the physical occupation and online. Yesterday we put up a cover on our geodesic dome and now have a more weather-proofed area to use for our information and media center. We should have wi-fi as soon as tomorrow. We also have some filing cabinets as a community drop-box where you can drop off ideas for future events, flyer designs, ideas for teach-ins, etc. as well as an events board, a supplies needed board, and a lost and found. These are all located in the dome. Tomorrow (11/7), we will be moving our camping area in an effort to protect occupiers a little better from bad weather as well as show a strong presence from the street. We could use your help anytime from noon to nightfall, and if you have a tent there, please try to come by to move it no later than Tuesday. In addition, we will be offering a community yoga class tomorrow, Monday, from 4:30-5:30 on the grass out front and a Media Committee meeting at 6:30. We have several brand new donated yoga mats for your use if you don’t have your own. All events are always at the occupation at 240 Moana Lane unless otherwise noted. We also have our Issues Forum today from 2-5 p.m. at the downtown library auditorium. Lastly, if you have any submissions for the Occupy Reno art show benefit, they must be submitted by Friday, November 11 to media.occupyreno@gmail.com or in person in the Media drop box. Thank you for all your support Reno. Things are really starting to come together with our infrastructure and communication, so that we can start focusing on making real changes. Here it is for your viewing pleasure! Thank you Haley and Tom for representing us so well. THE 2ND ISSUES FORUM – Don’t Miss It! Sunday, 6 November, 2-5 PM, at the Reno Downtown Library. To bring about long term change we will have to create an issues platform that the public can understand and embrace. Only then can we force the government to change the laws, regulations and policies of the land. Join us. Raise your issues. Explore issues in more depth. Challenge the movement, if you wish. But, get educated and get involved! Hope to see you there.